These are the insulated boots from an old set of one-piece duck waders. Once the waders got a leak, I cut off the boots and use them for this time of year when I don’t plan on going in the water. Can’t cleat them afaik. Haven’t gotten around to spending any real money on waders. In other news, sore today. Mostly from the constant tensing and correcting that I had to do on the icy banks but my elbow is also messed up a bit as it was the principle point of contact when I fell. Casting arm... Imagine if I had broken it. Wouldn’t have sidelined me long but would have been interesting to have to adjust. Doubt I could cast lefty, but properly motivated, who knows? I mouse lefty now due to a hockey neck/shoulder injury about 10 years ago. Love that dark Brookie. The ones with the all black mouths are really creepy looking. Adventures in the snow and Ice. Been there. On the day this was taken I had just fallen flat on my back slipping on some snow covered sheet ice. Probably the hardest fall I've ever had. Landed square on my net, which I later discovered had broken and punched a hole in my back. And in the process I managed to snap the tip off my fly rod. As I lay there on the ground taking stock that physically everything still functioned, all I could think about was if I had injured myself bad enough that I couldn't walk, how long it would take to freeze to death. It was over a mile from my car, there was no one else on the stream, and there was no one within shouting distance that could hear me. The drive back that day was a bit harrowing too, as I discovered that my car couldn't make it up the hill I had drove down a few hours earlier. 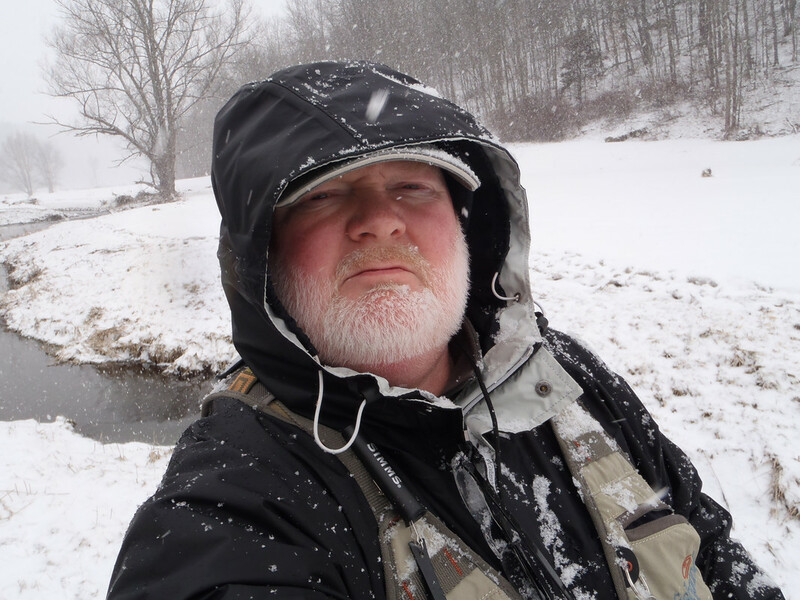 That was last time I went fishing in sketchy winter weather. That stream looks familiar if I’m not mistaken. I would have found your remains eventually and looted what I could, built a funeral barge and lit it on fire and sent it on its way. And you would have loved that brookie and maybe you’ll get it this year. I knew a fish like that could be in there. Oh yeah an traded your car to a Hill-Bob for stream access. I've been telling myself for a long time that I should learn to cast left-handed, just in case. I'd hate to be unable to fish because something happened to my right arm. But I haven't gotten around to it; hope I don't come to regret the procrastination. I read a book by Ernest Hemingway's eldest son Jack, who was an avid fly angler. He was shot in his right arm and captured in WWII. The German doctor who treated him wanted to amputate his right arm to avoid infection, but Hemingway balked because it was his casting arm. He opted for antibiotics and was able to avoid kidney and liver damage by drinking as much water as humanly possible. 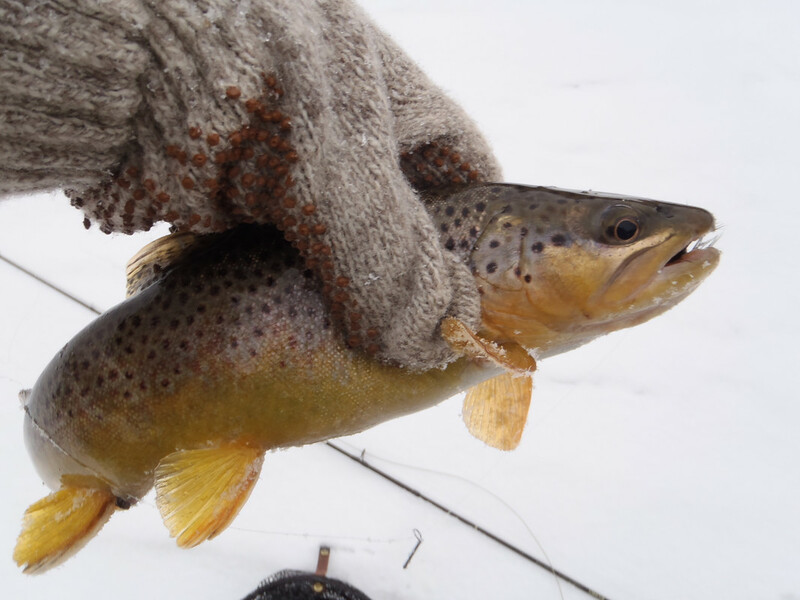 In the end, he regained the use of his right arm and had several decades more of fishing. Haha, thanks but I don't sweat it. I get out so much that these things are just blips and sometimes my "failures" are more memorable than an average good day. I try to take it all in stride and like to share my screw ups almost as much as my successes. Big fish to lose Gurth, but I doubt he’ll be moving far with the forecast on tap. Looking forward to the photos. Ouch! But, none of the locals would be caught dead in an Altima. And yes, that's your old stomping grounds. It was a weekday in March, as I recall. Would've been awhile before anybody came through there. There was only a slight chance of snow in the forecast, which turned out to be 4" with a coating of sleet. Couldn't make it up that damned steep hill heading east. Had to white knuckle back the car down the hill backwards. Eventually made it out the other directions when a county truck went through. It was one of those WTF moments. Kinda put me off fishing for awhile. I remember being so pissed that I broke my rod. Decided to toss a few casts anyway with what's left and still managed to catch a Trout. If you look carefully you can see the broken tip at the bottom of photo below. But, as they say, adventure only happens when things go wrong.